P1 AquaX made its first visit to Minehead at the weekend with more than 40 jet ski riders from seven countries competing for UK and European titles. The inaugural Minehead Summer Festival served up two days of high-speed marine motorsport action that attracted thousands of spectators to the West Somerset coast. 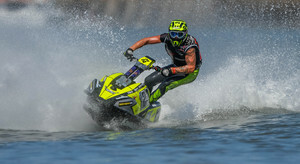 The event was the climax to the P1 AquaX UK Championship and the penultimate round of the 2018 EuroTour series presented by Experience Kissimmee. A total of seven UK titles were up for grabs, and picturesque Minehead Bay with the striking backdrop of North Hill provided a superb arena for the fast and furious action. Race conditions were almost perfect, with a little rough water in the Bristol Channel to please some of the riders. The experienced Phil Pope had a memorable weekend, securing his fourth Pro Enduro national title with a clean sweep of victories. Simon Gill, the 2017 UK and European champion in 2-stoke sprint, travelled home to Bristol with both the Ski Pro 2-stroke and 4-stoke championship trophies in his holdall. 16-year-old Dylan Green from Derby could be eyeing up the Pro class for 2019 after clinching the Amateur 2-stroke title. Reigning 200 Amateur champion Carl Lofthouse moved up to the 300 category this season with great success, and his victory in Minehead saw him take the title by a comfortable margin. In the 200 class, the season-long battle between Nigel Williams from South Wales and popular Scotsman Duncan Johnstone ended with the Welshman becoming a P1 AquaX champion for the first time. Experience Kissimmee team rider Ryan Willow won all three races to be crowned Spark national champion ahead of Aaron Rowe and Elliot Cable.